There was fire in the sky in the early evening of November 20, 2008, as a massive meteorite streaked across the Canadian Prairies. The sky lit up as far north as the Territories, and as far East and West as British Columbia and Manitoba respectively. As we are near the latter part of the year, the days inevitably are getting shorter, so it is already quite dark by 530PM when the meteorite screeched across the sky. As a result, residents of Medicine Hat were amazed to see how it apparently seemed like it was midday time from the flame-engulfed ball of space rock. 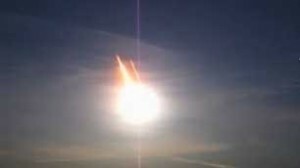 It is speculated that the meteorite fell somewhere in central Alberta. Search parties are expected to begin this weekend to try and claim pieces of the rock. This entry was posted on Friday, November 21st, 2008 at 3:06 PM and is filed under News & Announcements. You can follow any responses to this entry through the RSS 2.0 feed. You can leave a response, or trackback from your own site.